Thank you to all the new subscribers to my page. I have been a bit slow to write here yet that does not mean there has been no action. Quite the contrary! Funny things happen at Births. The last home birth I attended: I spent a good three days with the Mum while she went in and out of the early phase of labour for many hours. Surges would start and then stop and then we would all sleep. We patiently waited and I could not leave the mother on her own. We ate, we chatted, we watched TV series together. A good way to bond with people I did not initially know well. Eventually, birth progressed steadily along. A picture came to mind of me struggling to take a splinter out of the fleshy pad of my thumb. Patience and a steady hand are key! At one point, Mum and Dad were swaying together in the bedroom and I quickly left the room to fetch some extra towels and a receiving blanket. Suddenly a thunderous and explosive noise came from the roof and a clattering crash. I rushed back to the room thinking the bedroom cupboards had fallen onto the couple and I would have to extract them from beneath. The husband checked the house, then went outside. There on the patio, lay a massive tyre from a passing lorry on the nearby highway. 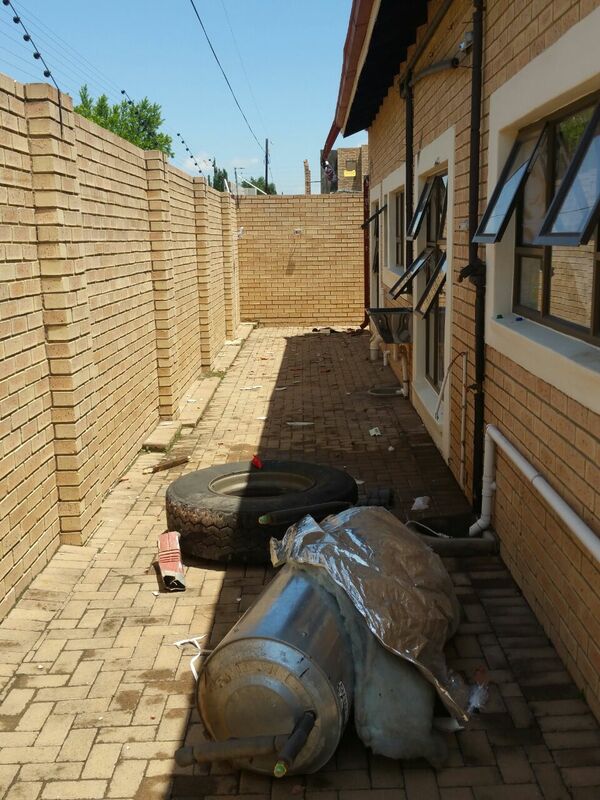 The roof tiles were broken, gutter smashed onto the ground and next to it, lay the hot water cylinder, which had been pushed away from its hinges on the wall. Water gushed from the broken pipe and we had to insert a quick stopper to quell the flow. The geyser lay there, inert and we were all astounded that we had escaped the impact of the enormous flying tyre. About ten minutes later, the mother felt a strong sense of urgency and after 3 pushes, the baby slipped out of her body and was lifted into welcoming arms. Relief and ecstasy abounded. Was it a random accident? Was it providence after all? Gave birth to my first on this day – 19th December – 34 years ago. Lovely to read the story. Thank you for sharing your special experiences. Happy Birthday for you both Karen!